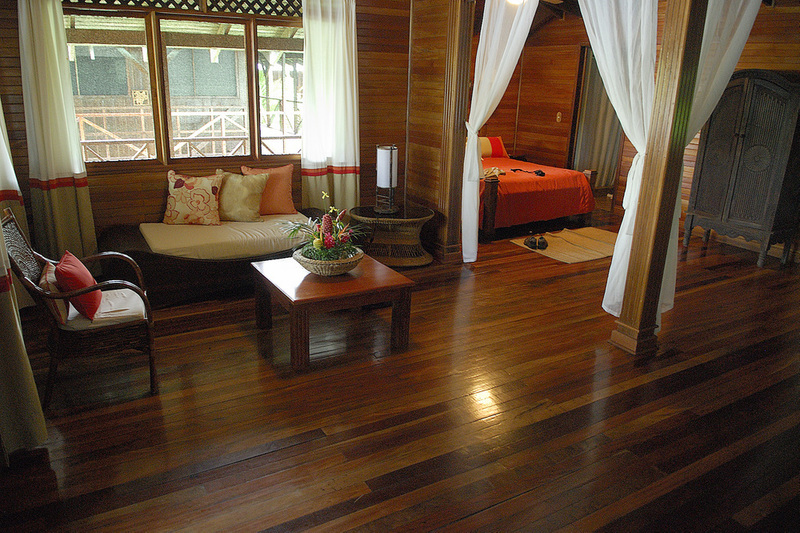 The remote and rustic Tortuga lodge is owned and managed by CRE, and is accessible by water. After traveling with Adventures by Disney (see trip report here) in Arenal and Manual Antonio, we extended our trip in Costa Rica to visit Tortuga Lodge in Tortuguero on the Caribbean coast with Costa Rica Expeditions (CRE ) At the time we traveled, the ABD trip we took did not offer this itinerary. Our adventure began early with a pick up at our San Jose hotel and we transferred to a small plane headed for the Caribbean coast. We loved the idea that we were able to see the country from the air, and it is the quickest way to get to this remote area. Other travel options include a land transfer with a switch to watercraftmaS. Small plane transfers between locations within Costa Rica can be another exciting part of the trip! Above the clouds, but not above the mountains and volcanoes. Approaching from the air, we had an appreciation for the wildness of this part of Costa Rica on the Caribbean coast. We had selected this itinerary specifically to see the sea turtles nesting on the Caribbean beaches, but during the day, the canals that serve as the main transportation arteries for the area and are teeming with wildlife that can be explored by boat. Staying at the canal side Tortuga Lodge and Gardens, allowed us to explore the area with expert guides in comfort. The rough Caribbean coast (on the right of photo) is not a beach destination for people, but for millions of years, sea turtles hatch and return to lay their eggs here. The "tourist attraction" is the huge network of canals that serves as the main arteries of the area and are teaming with wildlife. Tortuga Lodge's location on the canals in the jungle almost gives one the feeling of being on a ship or in upper level rooms, in a tree house. Each day the guides at the Tortuga Lodge take guests out for activities on the canals. During our trip, we took a small motorized boat out onto the canals twice a day. We had taken our young girls to Disney World a few times and they compared this to the "Jungle Cruise" ride. The difference was that all of the wild life was real, not audio animatronic! But unlike Disney World, there were no warnings that "you might get wet", instead our guide told us, "you WILL get wet!" Occasional deluges are common in the rain forest during rainy season, we had our quick dry clothing and rain gear with us and the boat is equipped with huge waterproof ponchos, but we expected to get wet and we did! Our family heads out for an excursion in the National Park, still "dryish"! The canopy over the canals looks like a real life "Jungle Cruise"
It may have looked like the Disney Jungle Cruise, but the huge 15 foot crocodile we saw on the banks of the shore was absolutely real!!! Our guide cut the engine and drifted the boat gently to within a few feet of the massive animal, where we drifted and observed it relaxing on a log. 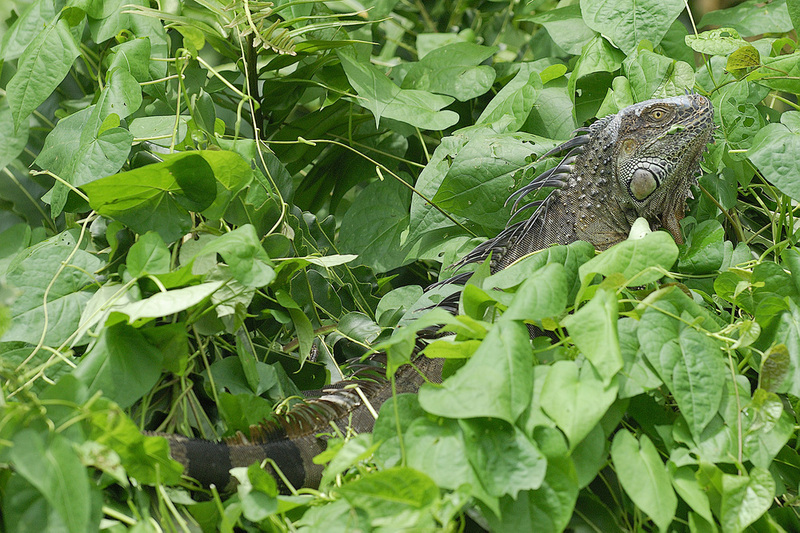 We also saw many reptiles, lizards, and iguana, birds, monkey and sloth. Our guide was very patient with our young daughters, if he spotted something, he would help them find it with their own binoculars. 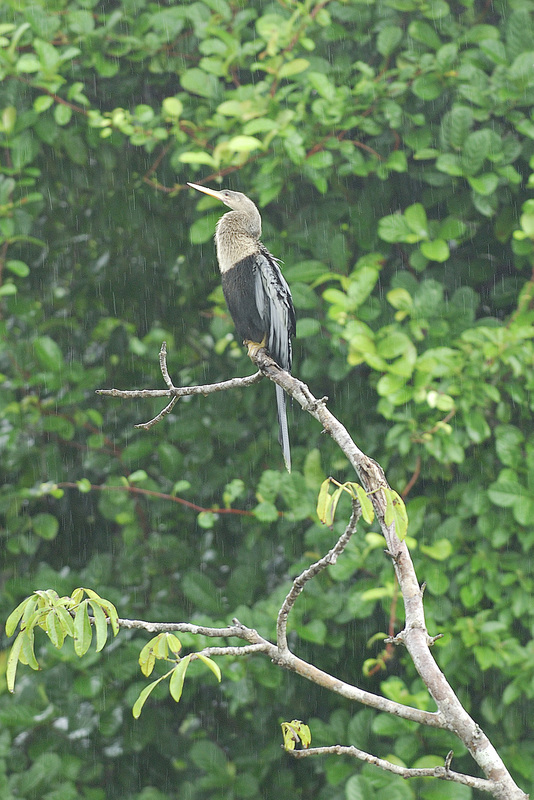 Despite the occasional deluge, the sun also came out and we were able to see and photograph dozens of animals. We even saw a baby manatee, snugged up against a log; our guide said it's mother had not been seen recently, and that the park rangers were keeping an eye to see if it needed rescuing. We saw lots of howler monkeys. They call to each other in a way that sounds like dogs barking. We've always found monkeys fascinating to watch! As evening fell we had the opportunity to go out onto the beach on the Caribbean and look for nesting sea turtles. There are different seasons for nesting and hatching. This area is one of the most important areas for sea turtle reproduction, and Costa Rica has preserved the area to protect them. However, we learned from our native guide that his parents and grandparents used to hunt the turtles and eggs for food and and to use their shells. It wasn't until the Sea Turtle Conservancy got involved with the government and recognized that education of the local people was the only way to save the turtles. The tours are carefully monitored and controlled. There are set times to leave for the beach, and each group is led by a local guide who uses a red light to illuminate the turtles. No flashlights or cameras are allowed on the beach as these can disturb the turtles. We had to follow the guide quietly on the beach until a female turtle was found and had already begun laying her eggs. If she is disturbed while digging her pit, she will leave. There were several groups on the beach and the guides used walkie talkies to control viewing so that only one small group at a time could view the turtle. We were able to see a huge female sea turtle, larger than a child's coaster sled, laying dozens of eggs into her pit. This careful control is meant to protect the turtles, and we saw first hand that it is working. Our guide explained he had been trained and licensed to lead groups on tours and now his family buys food with the money he makes from the eco tourism instead of needing to hunt turtles like his parents.